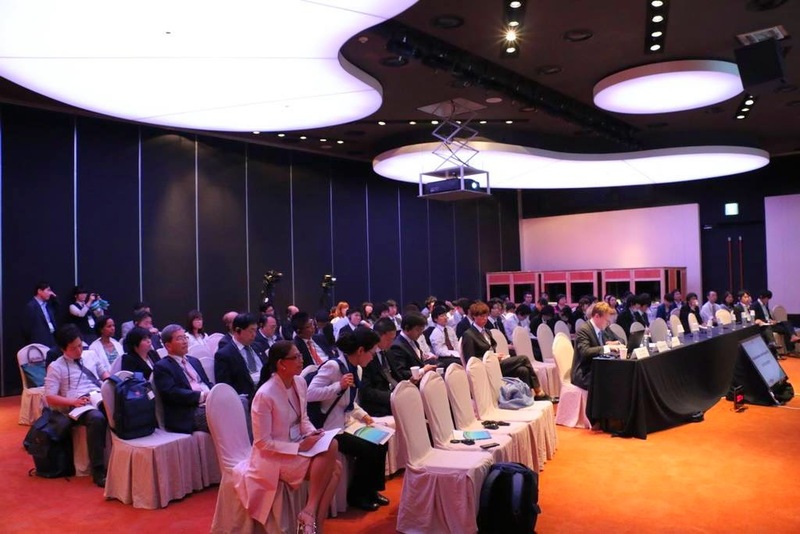 For the second time, Economic Freedom Network (EFN) Asia participated in the Jeju Forum for Peace and Prosperity annual conference, held at the southern island-province of Jeju, South Korea. 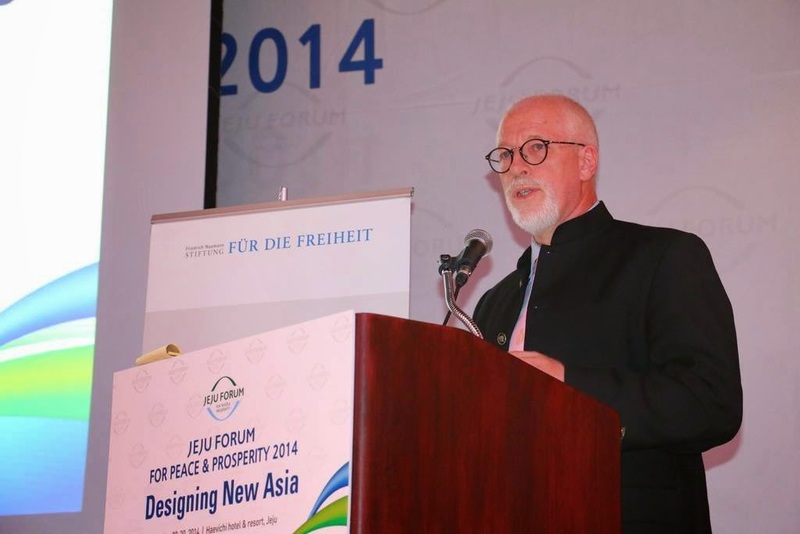 This year's conference ran from May 28-30 with the theme, "Designing New Asia." Below is the group photo of EFN delegates to the 2014 Forum. 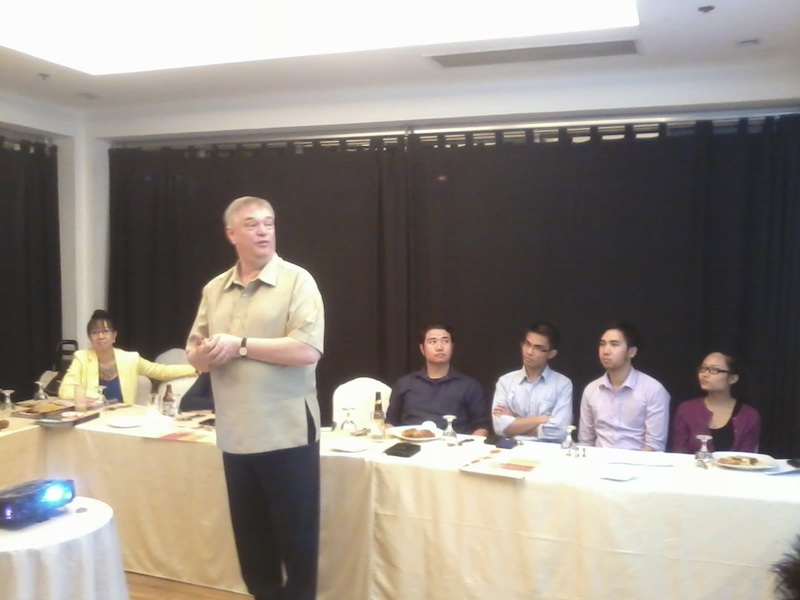 From left: Lars Andre Richter, Country Director of the Friedrich Naumann Foundation for Freedom (FNF) for South Korea, Dr Sethaput from Thailand, Sungeun Lim of FNF Korea, Dr Stella Quimbo of the Foundation for Economic Freedom (FEF) in the Philippines, Rainer Adam, the outgoing FNF Regional Director for East and Southeast Asia (he's moving to head the FNF Regional office for East and Central Europe next month), Peter Wong of Lion Rock Institute (LRI) in Hong Kong, Miklos Romandy of FNF Regional Office in Bangkok, and Pett Jurapaiboon, the Regional Program Office of EFN Asia. 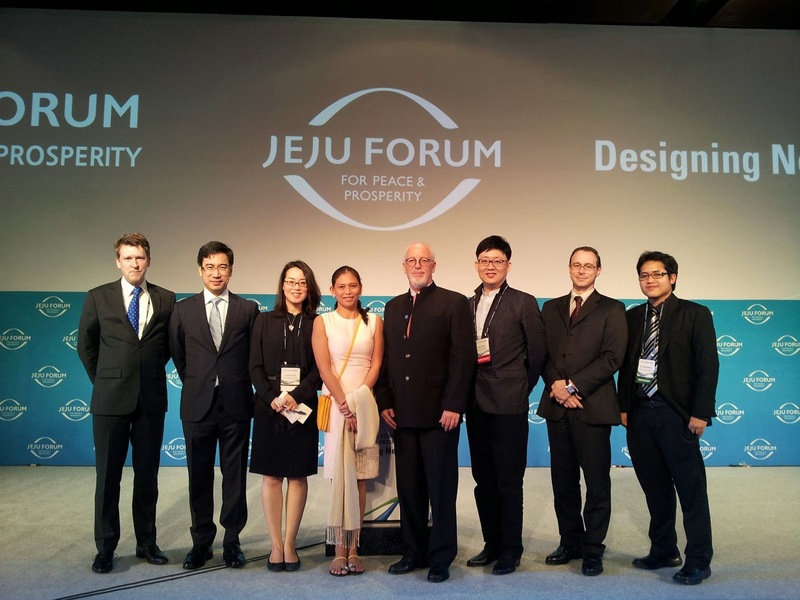 In the Jeju Forum 2013, this is the EFN delegation, below. 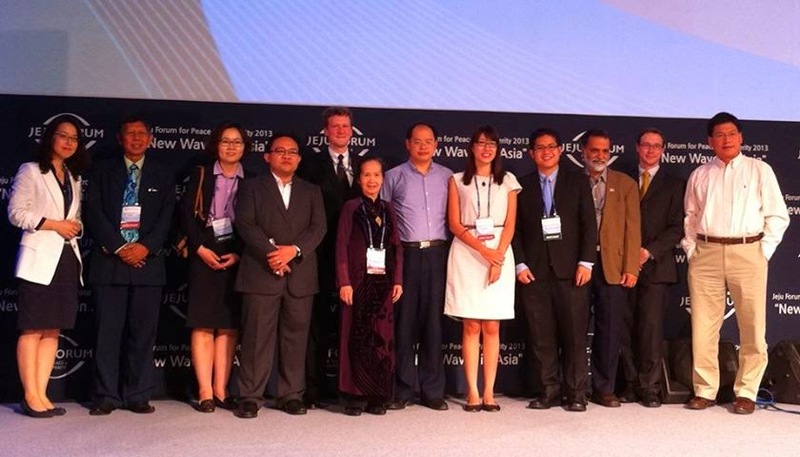 From left: Sungeun Lim of FNF Korea, me, Ms. Kim also of FNF Korea, Wan Saiful Wan Jan of IDEAS (Malaysia), Lars Andre Richter, Pham Chi Lan (Vietnam), Feng Xingyuan (China), Tricia Yeoh (Malaysia), Pett, Barun Mitra (India), Miklos Romandy (Austria), Liu Junning (China). Not in the photo with our group was Sam Raimsey (Cambodia) and Dr. Choi Byung-il, they went somewhere when the photo was taken. 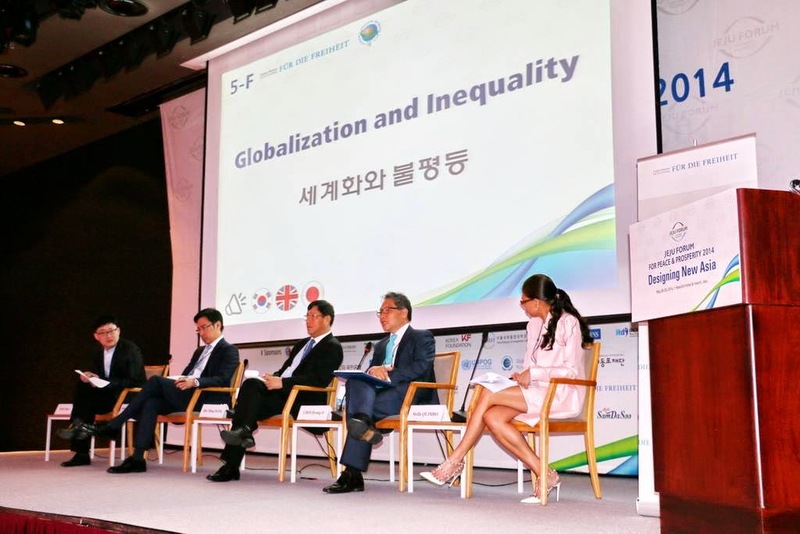 Dr. Rainer Adam gave the opening message for the EFN session today on "Globalization and Inequality". The EFN panel of speakers and discussants. Peter Wong was the panel moderator while Deputy Minister Dong was the main speaker. Last year, this is our panel. Wan Saiful was the panel moderator and Sam Raimsey (3rd from left) was the main speaker. 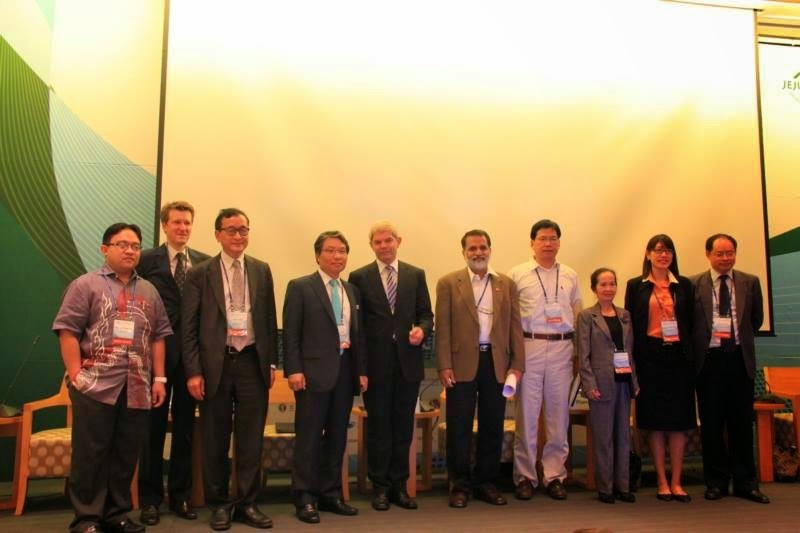 Lars gave the opening message while German Ambassador to S. Korea, Rolf Mafael (5th from left) gave the closing remarks. I was the panel rapporteur, I was sitting and listening to the discussion including the open forum and I took this photo :-). Here is my Rapporteur's Report of our panel, "Dealing with Economic Nationalism". Good audience in the EFN panel discussion today. All photos today from Miklos and Pett. * If there is no inequality, people in many countries will be equal... equally poor and destitute. ala N. Korea. * One chart from John Stossel here. Global poverty in absolute number is high because global population is rising. But global poverty (then defined as earning $1 a day/person) as percent of global population is declining. But the UN and the multilaterals keep saying "poverty remains high and alarming", they changed the definition of poverty to earning $2 a day/person. * Governments and the multilaterals are dishonest in discussing poverty. If they want more money from taxpayers, they say "poverty remains high, very alarming", things they were saying 6 decades ago or more. When they want to brag about their "accomplishments", they say that "poverty has declined but there are challenges". I just received from a friend, a Joint Statement made today on how to improve EPIRA implementation. Many of these points are practical, some are technical. I fully agree with the statement, "EPIRA is not the problem, failure to implement it properly is." The call by many populist and left-leaning groups to "junk" or "amend towards greater government role" EPIRA is wrong. Amending or making changes in the Electric Power Industry Reform Act (EPIRA) or the Republic Act No. 9136 will not solve the problems because EPIRA is not the problem, failure to implement it properly is. If EPIRA is sent back to Congress for review, the uncertainty it will introduce into the regulatory regime of the power industry will lead to a potentially chaotic system, and worryingly put our future needs at risk at a time when our supply of power is marginal. Brownouts will be inevitable if we don’t build new power plants. International and local investors and financial institutions won’t invest in an industry where the rules are not known and stable. The national government should announce now that EPIRA will not be amended, as amendment will not solve the present problem, and the government should increase dialogue with industry participants to reduce key uncertainties or changing material rules midstream. For instance, the basis for recent changes in the Wholesale Electricity Spot Market (WESM) prices was unclear. There were also changes in the rules, such as imposing a cap (50%) on the level of output that a Retail Electricity Supplier (RES) can source from its affiliated power generators; and how to count maximum installed generation capacity, which now includes power controlled by RES and results in double counting. These should not be done without full discussion. 9. Deciding on what to do with the Malaya plant. 11. Looking for ways to improve bidding for new plants to encourage more participants,and reduce disputes. This meeting should include reviewing the role of each entity involved in the power sector, whether it should retain the responsibilities it now has, whether these should be strengthened, or amended or transferred elsewhere. Finally, we urge the national government to declare power plants as critical infrastructures or projects eligible for registration with the Philippine Economic Zone Authority (PEZA) to streamline acquisition of permits and approvals from all local and national government agencies. We believe urgent attention to these and other issues is called for and we look forward to working together with government towards an improved power sector. 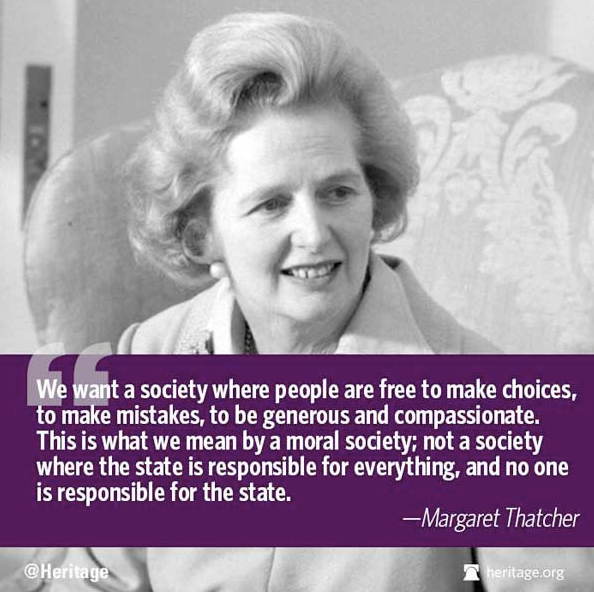 A welfare and nanny state will ultimately over-extend its "care" for the citizens. Spy, stop and penalize them because it cares for them so much. This is from a Filipino-British friend living in UK, he wrote this yesterday. We now have a heavy police presence. There are frequent checkpoints with teams of maybe 10-20 police, their vans, cars and motorbikes spread out along the road. They randomly check motorists to make sure their papers are in order. I have never seen this as part of normal police procedure in the UK. Now it's like an every day thing. The other day they stopped two buses and had police checking IDs and questioning passengers. It's difficult to describe how unusual this is if you've never lived in the UK. But people don't seem to care. I'm sure they are comforted by it. You have to understand that these are not like Philippine checkpoints. They have mobile computers linked to their databases where they can check your details and past history. Last month we were all in the car with my dad driving. We were stopped because the policeman saw that my daughter wasn't using an approved child car seat. The policeman took photos of the whole car with everyone in it. He crawled around (yes, crawled around the car!) inspecting underneath, checking tire pressure and looking for other violations. (Do you see a Philippine cop doing that?) He then put my dad's ID into his computer and found a tax violation. The tax on our car had expired the week before and my dad had forgotten to renew it. Bam...two fines and a warning for a soft tire. Total cost: £160 (appox. Php12,000). You can pay online. Further, he made us to go to the nearest car shop to buy an approved child car seat before we could continue with our journey. I told my friend that it's indeed discomforting. As societies modernize, the degree of individual freedom -- freedom to be wise or unwise, to innovate or commit mistakes -- should expand, not decrease. Here. freedom of mobility of people is curtailed, they can be stopped by the police anytime anywhere even for no apparent traffic violation. It would seem that those in the Philippines and other developing countries have higher degree of freedom in this respect. Two friends made these comments when I posted this in Government and Taxes, Liberty and Responsibility fb group. (1) technology minus liberalism = orwell's worst nightmare. (2) Am surprised to hear that from a brit--I've always known that compared to the US, UK has always had tighter "monitoring" of its citizenry & residents. Even pet dogs' barking is controlled in Central London! If even a Beatles' impromptu rooftop concert at a city building was cut short by London police as it was causing some commuter distraction (not even traffic), it's not surprising that things have come to this. And these are just visible physical signs of police presence. In London, all TV and cable is registered--one cannot simply install one's own unregistered device without being found out. Even immigration keeps a close tab of all foreign residents & visitors--overstaying without being penalized is practically unheard of in this country. These are less visible signs (am not even talking about Snowden's revelations) but definite proof of tighter & more sophisticated control in a seemingly free world. More news links that my British-Filipino friend posted. (1) From The Guardian last February 7th. 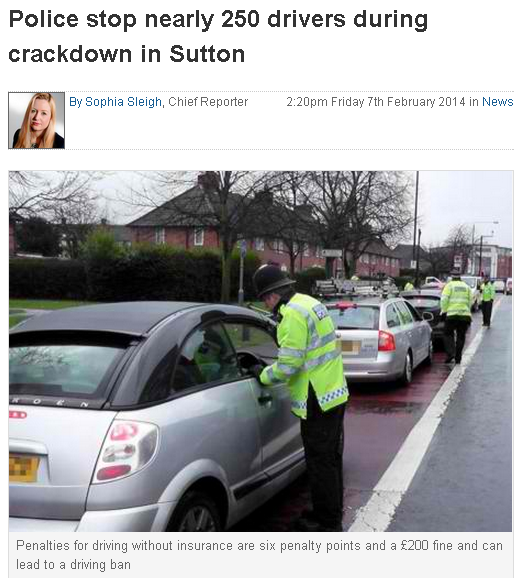 Police stopped nearly 250 drivers during a crackdown. A total of 242 vehicles were pulled over by the police, two of which were seized, during an operation on Wednesday, February 5, in Sutton. One driver was arrested for drink driving, one received a cannabis warning and two are due to be summonsed to court for having unroadworthy vehicles. Another driver was fined and received penalty points for having a bald tyre and one was fined for not wearing a seatbelt. Officers used automatic number plate recognition to target uninsured, untased and unregistered vehicles. Safer Neighbourhoods Insp Ian Hicks said: "This operation and others like it are all about catching criminals, deterring criminal activities and keeping the streets safe. These operations will continue and you will be caught if you don't have insurance or the correct insurance." (1) As expected, the community, even while they were victimised, supported the powers as a necessary thing. Just listen to them and the cognitive dissonance is glaring. (2) The motorist stops I described above must obviously be an extension to the 'Stop and Search' protocol. They tried it, liked it, and wanted to extend it into other areas. Anyone who says that the slippery slope fallacy is an invalid argument probably have never slipped down that slope themselves. Meanwhile, another new development in UK. From WUWT. The United Kingdom Independence Party, the only climate-skeptical party in Britain, has scored a crushing victory in Sunday’s elections to the Duma of the European Union. Britain’s most true-believing party, the Greens, won one or two new seats, but the second most true-believing party and junior partner in the Children’s Coalition that currently governs at Westminster, the “Liberal” “Democrats” (who are neither), were all but wiped off the map. The European Duma, like that of Tsar Nicholas II in Russia, has no real power. 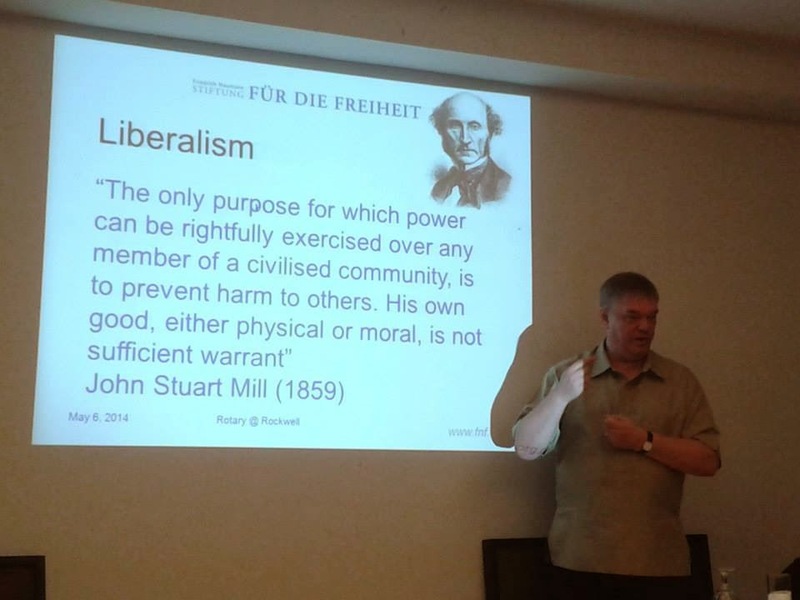 It cannot even bring forward a Bill, for that vital probouleutic function is the sole right of the unelected Kommissars – the official German name for the tiny, secretive clique of cuisses-de-cuir who wield all real power in the EU behind closed doors…. MANILA - The World Economic Forum (WEF) is among the unique inventions in promoting global economic and social dialogue among many sectors of different countries around the world. While the United Nations and its many affiliate organizations (WHO, ILO, IMO, WMO, FCCC, etc. ), WB, IMF, WTO, OECD, APEC and other multilateral institutions are all government clubs, or composed of governments only, WEF and similar international fora are private sector-initiated, invite participants from governments, multilaterals, corporations, civil society and academe, and are able to attract many high-profile participants from these sectors even if they have to pay hefty registration fees. 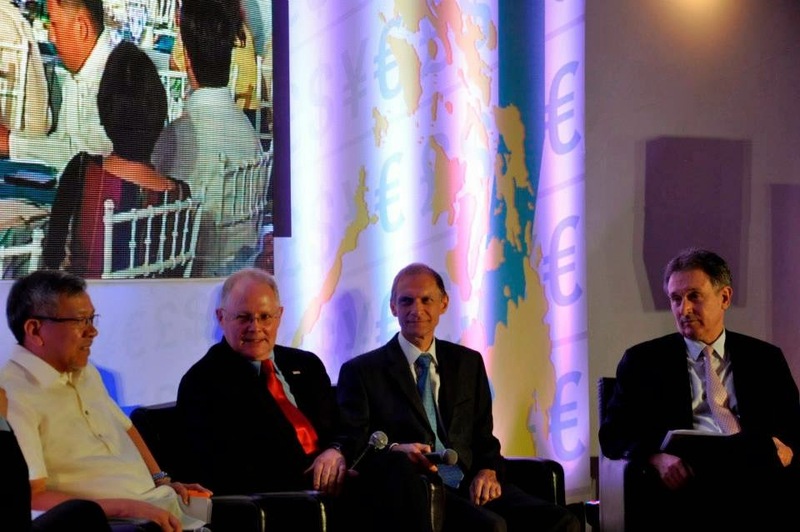 The WEF on East Asia forum 2014 will be held this week in Manila. Several heads of state, cabinet officials, CEOs of big corporations (national and multinational), heads of civil society and other organizations are attending. 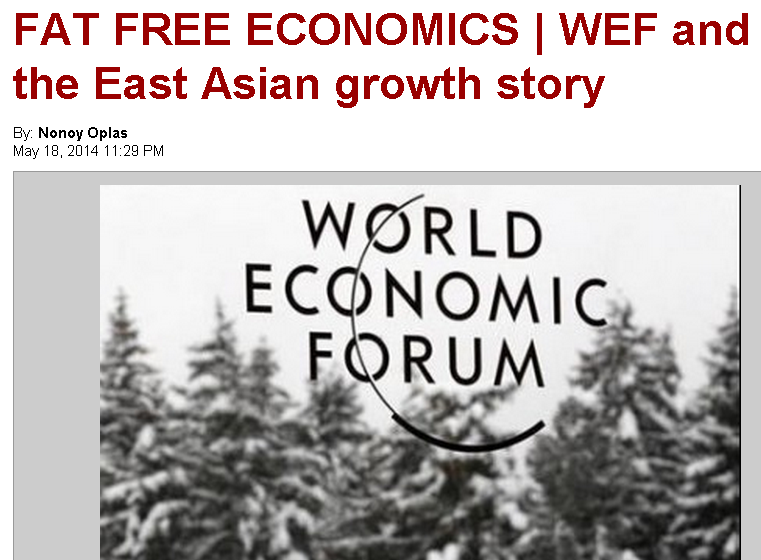 Since high and sustainable economic growth – which expands businesses and material wealth, creates jobs, lifts many people from poverty – is often the key concern of WEF and other international fora, the best region to hold it is in East Asia. Growth here is generally much faster and has been sustained for decades more than in other regions. I dug up the IMF World Economic Outlook Database, April 2014 for GDP size of the biggest economies in the world for the past two decades. I used data for 1993, 2003 and 2013, particularly the purchasing power parity (PPP) valuation of GDP as it has a more comparable pricing of goods and services produced in the economy. 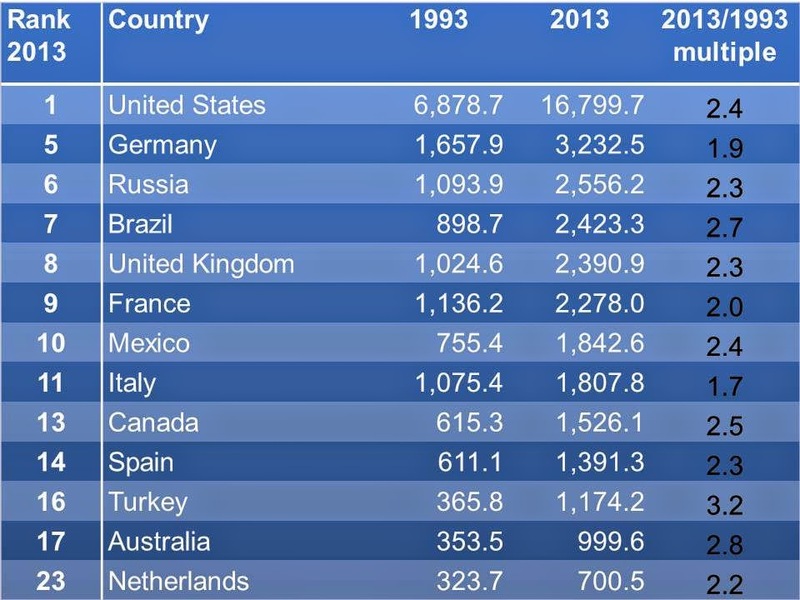 A decade after 1993, there have been some changes like China replaced Japan in the #2 spot, India jumped from #9 to #5 (see tables 1 and 2 below). The World Trade Organization (WTO) was created in 1995 and it heralded the start of fast growth in many economies, especially some emerging markets like China, India and Indonesia. This is because protectionism limits a country’s growth through (a) limited size of consumers and (b) limited source of raw materials, intermediate products and capital goods that can further expand the economy’s productive capacity. Free trade, or even reduced protectionism allows private enterprises to address these two limitations somehow. After another decade – and despite the various international financial turmoil (housing bubble burst in the US 2008-2009, European debt upheavals 2010-2012, among others), many economies in Asia were able to withstand the uncertainties. Early this decade, three of the four biggest economies in the world were in Asia. And two Asian economies that were outside the top 40 in the last two decades – Singapore and Vietnam -- were able to barge in. 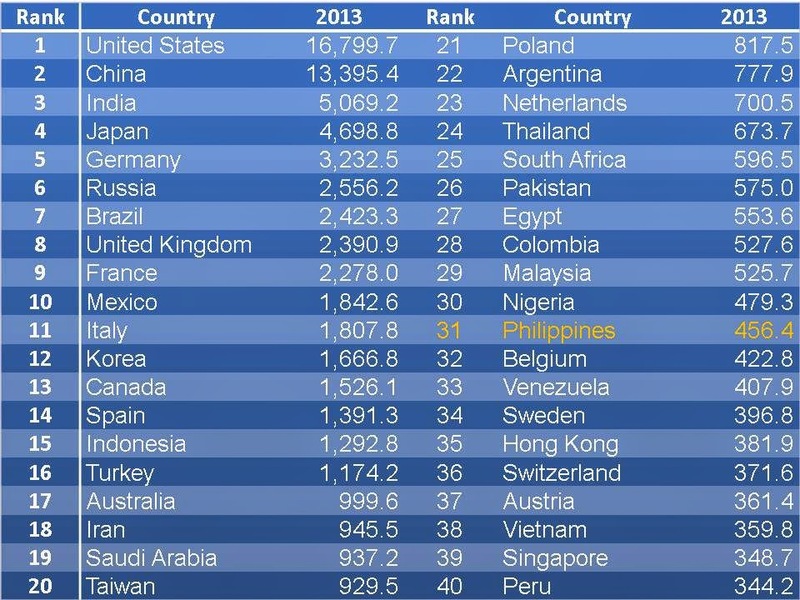 Other emerging economies which joined the top 40 were Nigeria, Venezuela and Peru. And a number of European economies were dislodged from the top 40, like Austria, Greece, Ukraine, Portugal and Norway (see table 3 below). That is what increasing globalization and mobility of people, their products and services, technology and capital, can do. To reallocate resources to areas where they are needed more, or priced better. 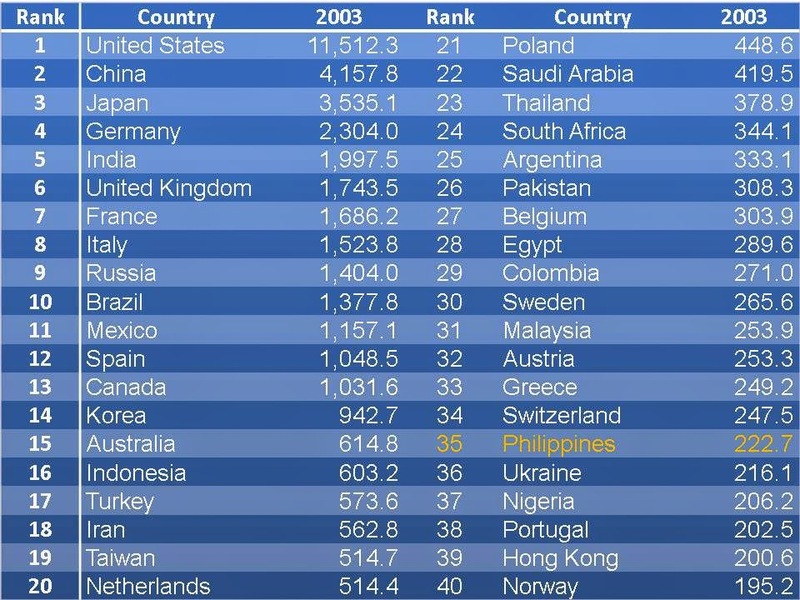 Notice also that many of the top 40 economies are also countries with big populations. People are the planet’s most important resource. Let’s analyze some Asian economies closer. Many of them were able to expand their economies by four times or more in just two decades. That’s a short period of time compared to a century or more for the industrial countries during an earlier period. Ironically too, two socialist economies -- China and Vietnam -- were able to optimize the opportunities of global capitalism and the generally free trade policy that dominate globalization. 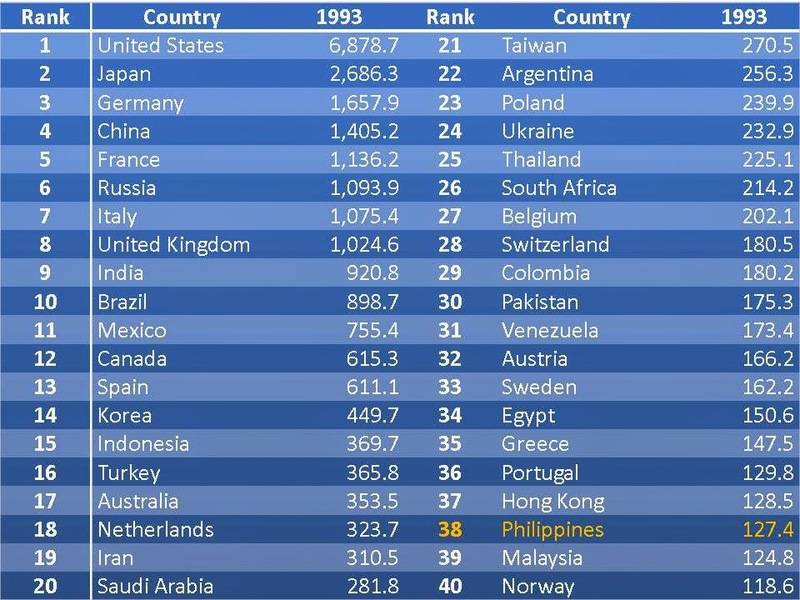 The Philippines was among the modest benefactors of globalization (see table 4 below). In comparison, not a single economy from North America and Europe was able to grow three times their size two decades ago. Germany and Italy failed even to double their GDP size within that period. Of course, these economies can brag that they were already on a high base, so that incremental growth was not fast anymore. This may not be a good explanation because of their ageing populations, tens of millions of their people need to be supported by more economic activities, especially in healthcare. The WEF is roosting on the region which has proven to be among the important engines of global growth. And it’s a region that will sustain the growth momentum and pace the rest of the world. This region has the world’s biggest populations, meaning the biggest number of entrepreneurs and workers, of producers and consumers. Asia needs to learn from Europe and North America. That heavy welfarism and bureaucratism are anathema to more growth and prosperity. Business and entrepreneurship is most dynamic when it is left alone to innovate and become more creative, more competitive. 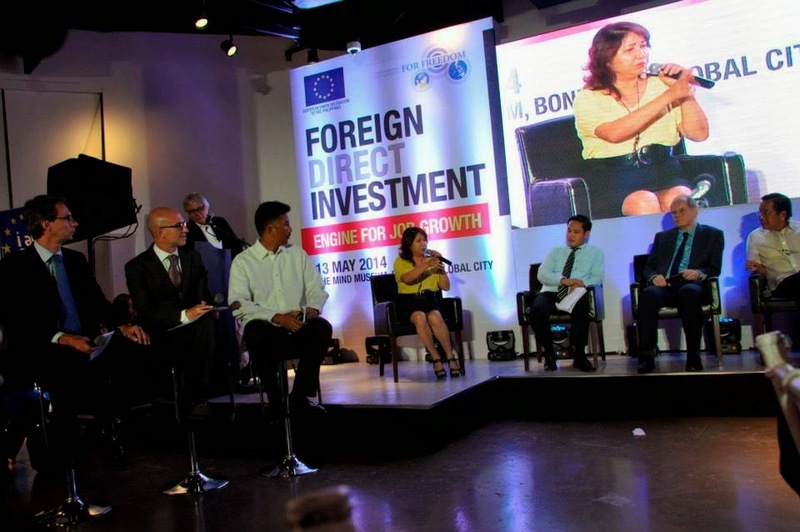 Last Tuesday, May 13, I attended the EU-FNF forum on "Foreign Direct Investment: Engine for Job Growth" held at the Mind Museum, Fort Bonifacio Global City, Taguig. It was a powerhouse forum. 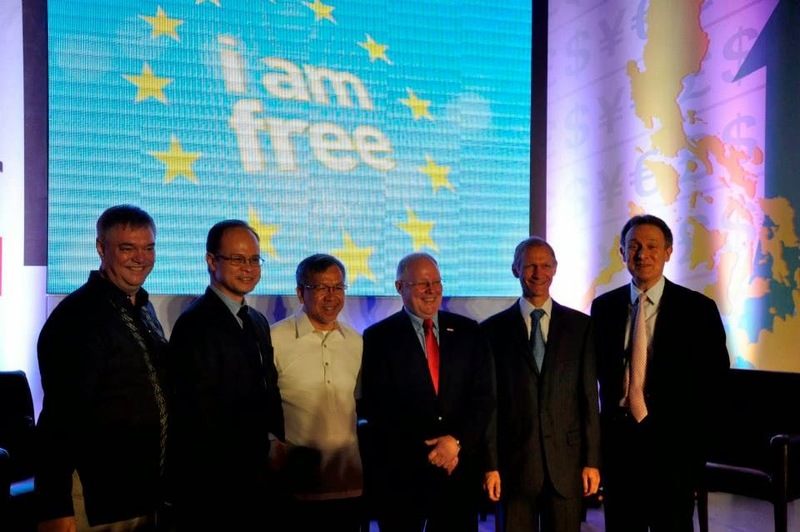 Welcome messages given by Jules Maaten, Country Director of the Friedrich Naumann Foundation for Freedom (FNF) in the Philippines, and Guy Ledoux, Ambassador of the European Union (EU) Delegation to the Philippines. Amb. 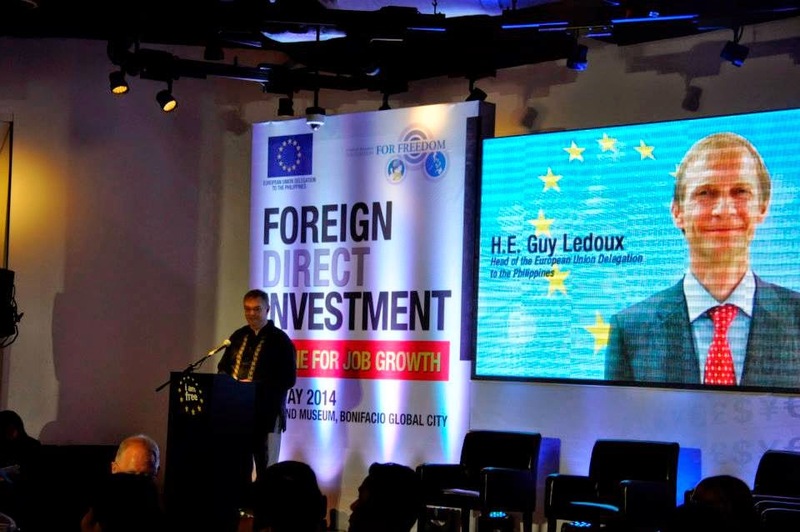 Ledoux expressed further optimism about the Philippines and its business environment, saying that European investors are the biggest bloc of foreign direct investment (FDI) in the Philippines. A summary of the forum is also posted in the FNF website, EU FDI in PHL to Double in Five Years and there is a long quote from Amb. Ledoux there. 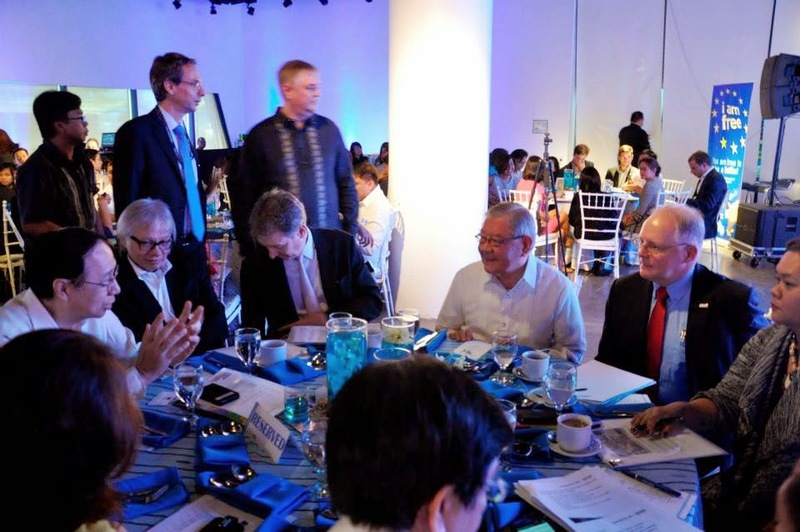 House of Representatives Speaker Feliciano "Sonny" Belmonte (in barong, seated right in the photo below) spoke and mentioned that he personally supports amending the PH Constitution and remove restrictions to foreign investments. He enumerated several important Congressional bills that will help encourage the entry of more FDIs. Like the Anti-trust or Competition Law, Tax Incentives Management and Transparency Act, amendments to the Build-Operate-Transfer Law, Cabotage Law, among others. I stumbled on this data from the IMF. Not only direct equity but other forms of asset inflows were used here, hence, a total of $28.4 billion inward direct investments were recorded in 2012. But interestingly, many Philippine-based businessmen, local and foreign, sent their money to the Cayman Islands and Virgin Islands. The two are considered as among the "tax havens" around the world because of the low taxes, low bureaucracies they slap on money coming from anywhere around the world. Which should be a lesson to the central bank and other government agencies: the less that you monitor and bureaucratize foreign investments and savings, the more that that they will come to you. The four important speakers in the first session, from left: Department of Trade & Industry (DTI) Secretary Gregory Domingo; Andrew Powell, Managing Director of Bosch Philippines, Amb. Ledoux and Donald Kanak, Vice Chairman of the EU-ASEAN Business Council. Interesting point from Bosch: the company being innovation driven, is inventing and innovating a new product every 25 minutes on average. Wow. Mr. Kanak said that by having more investments and competition, more high paying jobs are created, which provide more consumer and tax base for the country. Sec. 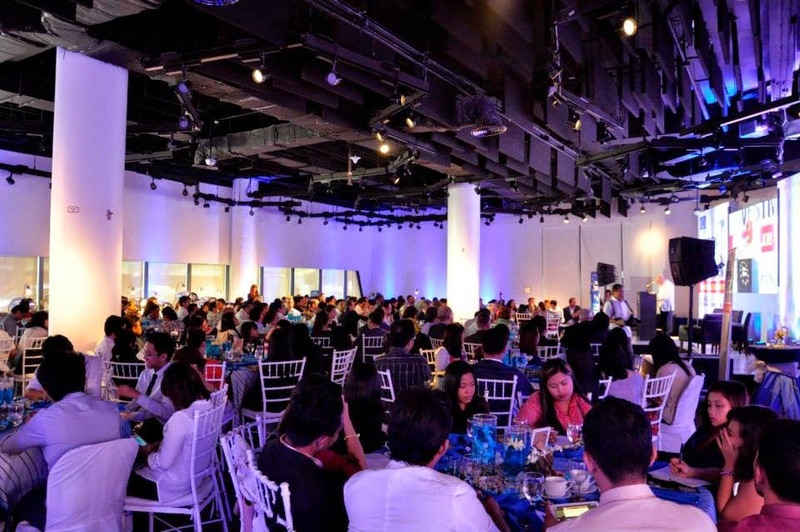 Domingo mentioned that one of the important assets of the Philippines is its big and young population. Yes, I fully agree. Big and young population is an asset, not a liability, that is why I never supported the RH bill, now called RH law. The average age of Filipinos, about 24 years old, is almost half that of Japan, 44 years old. Soon Japan, Taiwan, S. Korea, many European countries, will be begging for more Filipino workers and managers to run their factories, banks, hotels, offices and households. Or if their immigration policies will remain paranoid to the entry of more immigrant workers, many companies in those countries will locate here and take advantage of the country's big, young and trainable manpower. From left: Jules Maaten, Coco Alcuaz of ANC who acted as moderator in the panel discussion of these four prominent speakers. 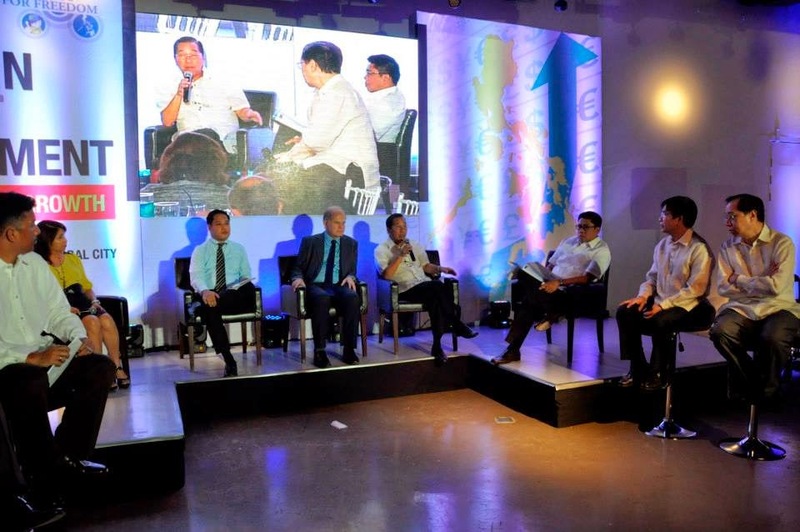 The next panel was bigger, five speakers and five reactors, moderated by Mr. Vergel de Dios, a veteran media man. The speakers were (1) National Economic & Development Authority (NEDA) Assistant Director-General Rosemarie Edillon, (2) Public-Private Partnership (PPP) Center Director Eleazar Ricote, (3) European Chamber of Commerce in the Philippines (ECCP) President Michael Raeuber, (4) Rep. Anthony del Rosario of Davao, and (5) Philippine Chamber of Commerce & Industry (PCCI) Honorary Chair Donald Dee. Toti Chikiamco pointed out that more than the high cost of electricity, what bothers many investors, those in SMEs in particular, are the high government-imposed minimum wages. Plus the various mandatory social contributions. This is a good point. Employment is a private contract between the employer and employee. A job applicant seeking high pay and many benefit package must compete with other job applicants with better qualifications and longer work experience, in landing that job. Government should come in only to enforce a private contract between the two camps if there is dispute in the interpretation and implementation of the contract. Government has no business actually setting what should be the minimum wage, the minimum benefit package, and so on. Minimum wage laws protect only those who already have jobs while providing no protection to those who are jobless or are still seeking work. Movement of FDI is directly related to movement of goods and services across countries and continents. Free trade and free mobility of factors of production are closely linked. When the business environment at home becomes more rigid, more bureaucratic and over-regulated, more taxed, investors and professionals will seek other location where they can do business in a freer environment. As Europe becomes more bureaucratic, economies in Asia become good prospects for investments as our politicians and bureaucrats here have not mastered yet the art of heavy bureaucratism that their counterparts in Europe and North America practice. FDI is both demand-pull and cost-push. Lots of good speakers, and lots of food after, it was a good forum. All photos except the table are from FNF facebook page. 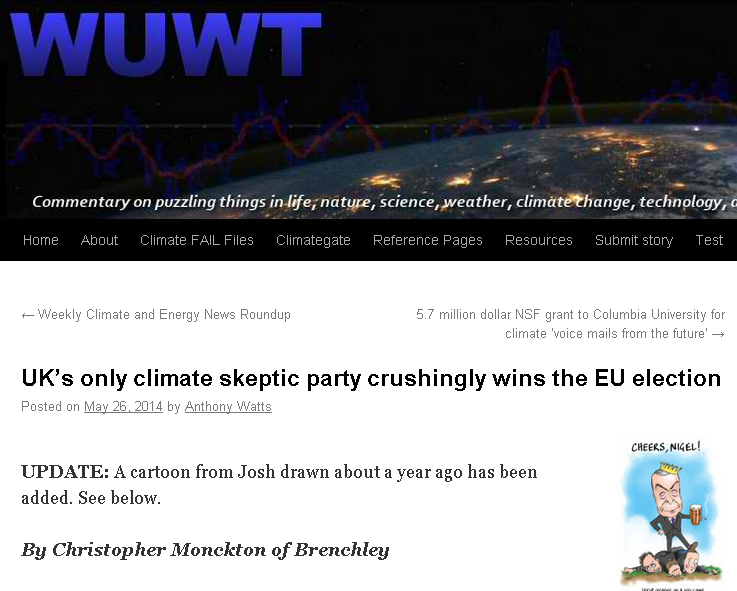 See this case of Dr. Lennart Bengtsson, a prominent Swedish climate scientist. The degree of intolerance, of inability to face the inconsistencies of the "man-made" global warming / climate change proposition, is very high. They are shooting the messenger, not the message. Attacking the person, not the issue. And the big irony, this is happening among natural scientists in the west, supposedly the beacon of social tolerance and scientific skepticism. The two Press Releases are posted in The Global Warming Policy Foundation (GWPF) website. London, 1 May::The Global Warming Policy Foundation is pleased to announce that Professor Lennart Bengtsson, one of Sweden’s leading climate scientists, has joined the GWPF’s Academic Advisory Council. Professor Lennart Bengtsson has a long and distinguished international career in meteorology and climate research. He participated actively in the development of ECMWF (European Centre for Medium-Range Weather Forecasting) where he was Head of Research 1975-1981 and Director 1982-1990. In 1991-2000 he was Director of the Max Planck Institute for Meteorology in Hamburg. Since 2000 he has been professor at the University of Reading and from 2008 the Director of the International Space Science Institute in Bern, Switzerland. Professor Bengtsson has received many awards including the German Environmental Reward, The Descartes Price by the EU and the IMI price from the World Meteorological Organisation (WMO). He is member of many academies and societies and is honorary member of the American Meteorological Society, the Royal Meteorological Society and European Geophysical Union. His research work covers some 225 publications in the field of meteorology and climatology. 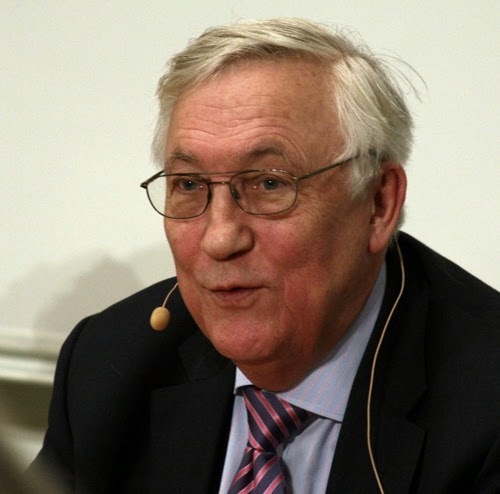 In recent years he has been involved with climate and energy policy issues at the Swedish Academy of Sciences. It is with great regret, and profound shock, that we have received Professor Lennart Bengtsson’s letter of resignation from his membership of the GWPF’s Academic Advisory Council. The Foundation, while of course respecting Professor Bengtsson’s decision, notes with deep concern the disgraceful intolerance within the climate science community which has prompted his resignation. Professor Bengtsson’s letter of resignation from our Academic Advisory Council was sent to its chairman, Professor David Henderson. His letter and Professor Henderson’s response are attached below. 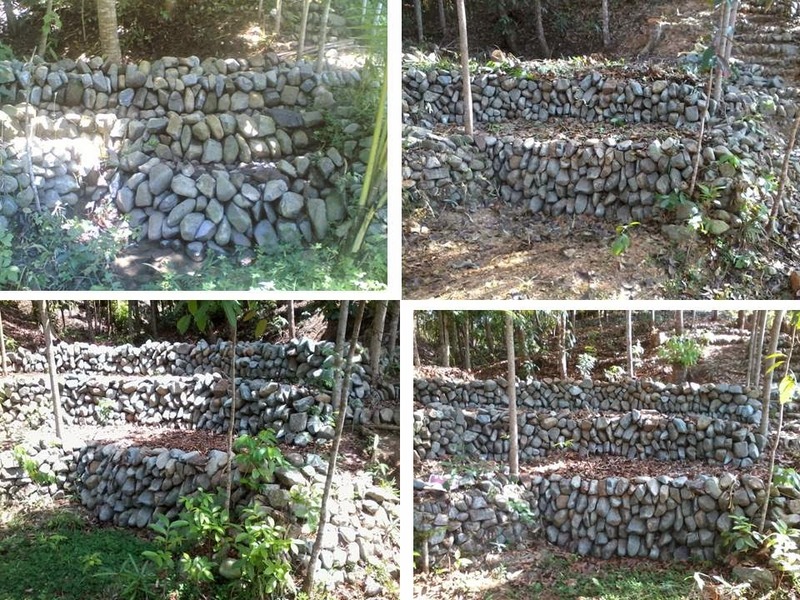 I believe that private property rights recognition and protection is a key program to encourage the dual goal of nature conservation and resource production. 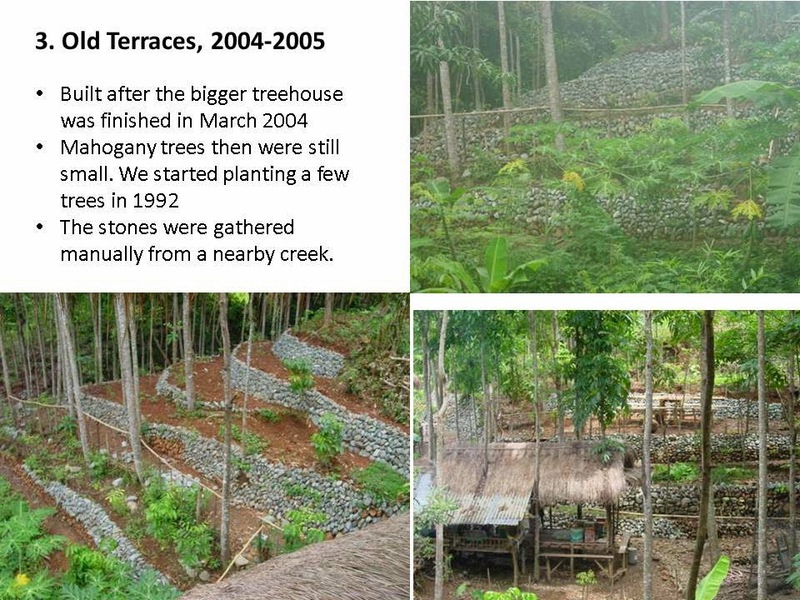 The "tragedy of the commons" is too glaring and too visible in many parts of public forest land in the country. 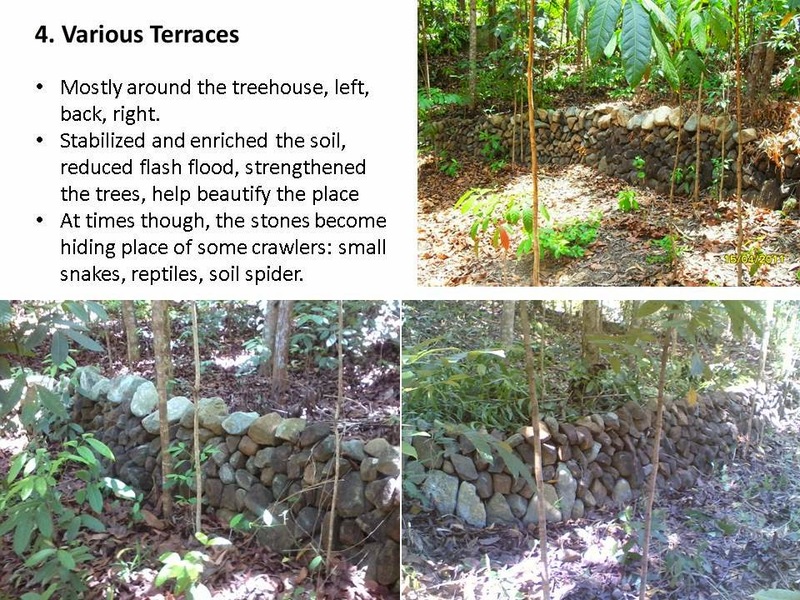 Which explains why many public or government "forest lands" are devoid of meaningful forest stand. 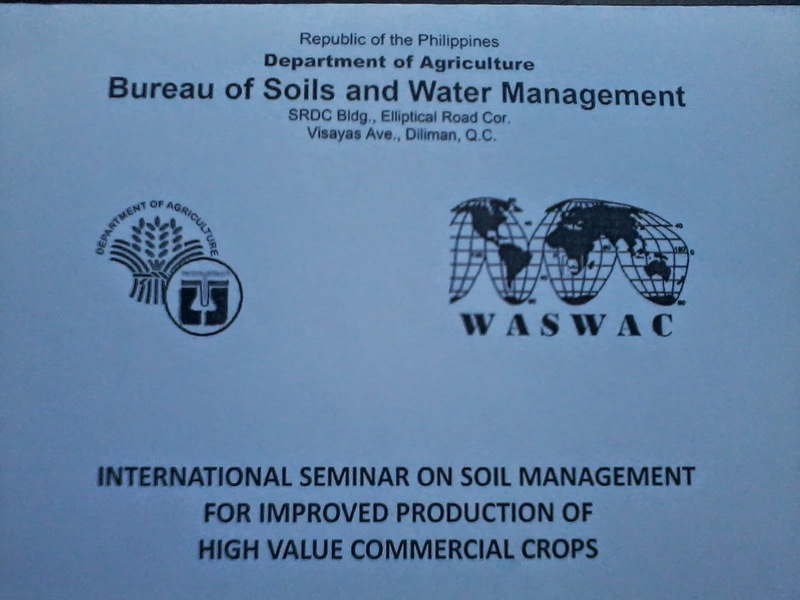 Yesterday, some officers of the World Association for Soil and Water Conservation (WASWAC) and soil scientists and engineers from Thailand, led by Dr. Samran Sombatpanit, Past President, and Dr. Li Rui (China(, Current President, of WASWAC, participated in a seminar organized by the Bureau of Soils and Water Management (BSWM), DA, in Quezon City. The group of Thai and Chinese scientists came from Aklan and attended the annual meeting of the Philippine soil scientists. Weeks before that, I was asked by Doc Samran, a good friend for nearly a decade now, if I can present our experience at terraces construction in the said seminar. I quickly said Yes to him. There were four paper presenters supposedly yesterday, but the Filipina speaker who was supposed to present a paper on vetiver grass for erosion control did not come. 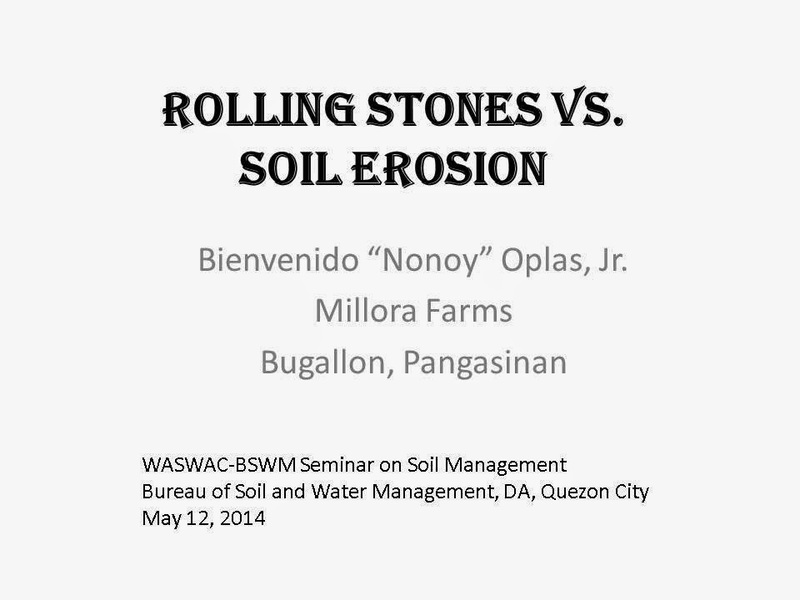 So only me, Dr. Alibuyog, an agricultural engineer from Mariano Marcos University in Ilocos Norte, and a Thai scientist, made brief presentations. BSWM Director, Dr. Silvino Q. Tejada, along with almost all division chiefs and directors of the Bureau, were there. A good article here from WSJ last Wednesday. The author is arguing for a more liberal or freer immigration policy by the Japanese government because of the huge manpower requirements by the ageing population. Something like 650,000 new immigrants a year. 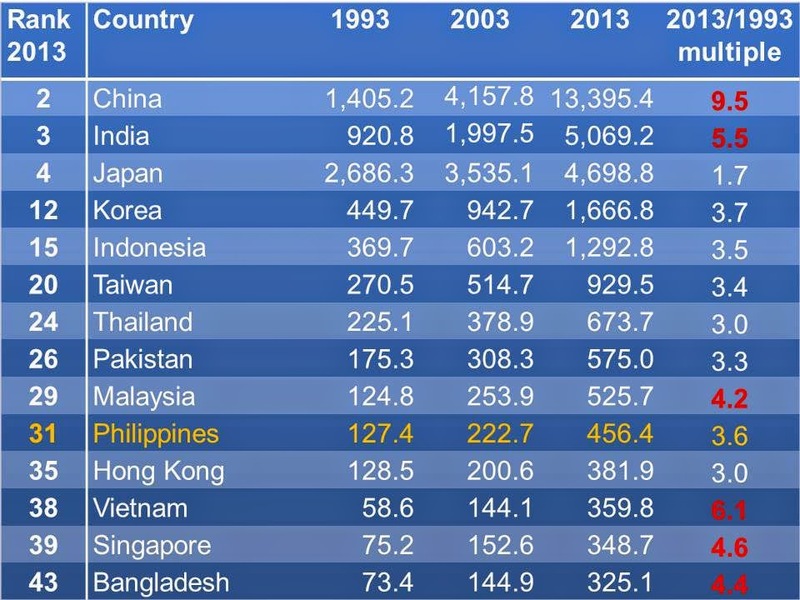 In Japan, Taiwan, S. Korea, other developed economies in Asia, Europe and N. America, flat or declining population is a problem while in developing economies like the Philippines, India and Indonesia, their rising population is considered by certain sectors as a big problem, big liability, instead of looking at it as a big asset. While Japan can invent more robots to run its many manufacturing plants, robots cannot smile and give "human touch" when replacing adult diapers or guiding old people to walk and stroll in a park. Government-sponsored population control in developing countries is wrong. And government strict immigration policies that restrict if not prevent private enterprises and households to get the necessary immigrant labor they want is also wrong. If the host governments are wary about possible crimes or health opportunism by the migrant workers, then government should simply do their basic function, to enforce the rule of law. And let the local employers, companies or households, provide private health insurance for their migrant workers. Below is the article. Enjoy. Discussions about Japan's economy generally focus on GDP growth, consumer confidence, business sentiment, unemployment, wages, investment and the like. Those are all useful markers, but if you want a clue about the country's long-term prospects, a far more significant statistic was released recently: The number of children in Japan has just declined for the 33rd straight year, and is now at its lowest level since data collection began in 1950. Young people between birth and 15 years old constitute only 12.8% of Japan's population; in the U.S. it's closer to 20%. Those over age 65 make up more than 25% of the population, a record high. The overall population has declined for the past decade. The litany of baleful consequences of population decline is familiar. Fewer children today means fewer workers tomorrow to support the non-working young and old. Fewer workers also means less growth, especially in an already advanced economy like Japan. Neither of the two most commonly cited solutions to this problem is satisfactory. Increasing the proportion of the working-age population that is actually working, especially by boosting the shockingly low female labor-force participation rate, will help in the near term. So will raising the retirement age so that Japan's wondrously healthy elderly stay in the labor force longer. Elderly Japanese women stand in front of Hina dolls displayed on the steps at a Shinto shrine in Katsuura city, Chiba prefecture, Japan. European Pressphoto Agency. But there's a limit to the long-term efficacy of either measure. Both women and the elderly die the same way today's cohort of working-age men eventually will. A consequence of having too few babies is that even if the labor participation rate reaches an unrealistic 100% in the future, the number of Japanese who are working will still eventually fall to below the number who are working today. Immigration is the obvious solution, and also the one that seems to be least politically viable. Only in recent months has Prime Minister Shinzo Abe's government dared to leak word to the press that a plan to allow up to 200,000 immigrants per year may be in the works. This would more or less stem depopulation by mid-century—if Japanese can also be prevailed on to increase their birth rate to a blistering 2.07 children per woman from the current 1.39. Good luck with that. Otherwise, Japan needs to let in around 650,000 immigrants per year to achieve the same population outcome. Good luck with that, too. 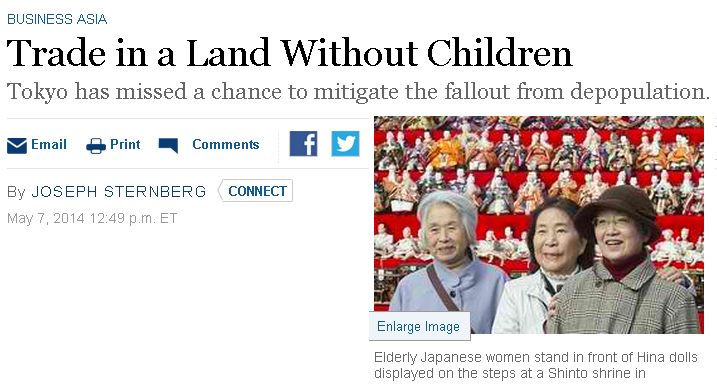 One feature of Japan's population debate is how blasé the Japanese themselves sound about it. Reporters can reliably find (elderly) interview subjects to aver that life won't really be so bad. It will be less crowded, and per-capita incomes will be stable. And allowing foreigners in, the subtext goes, will make the country's famously orderly existence far too chaotic. 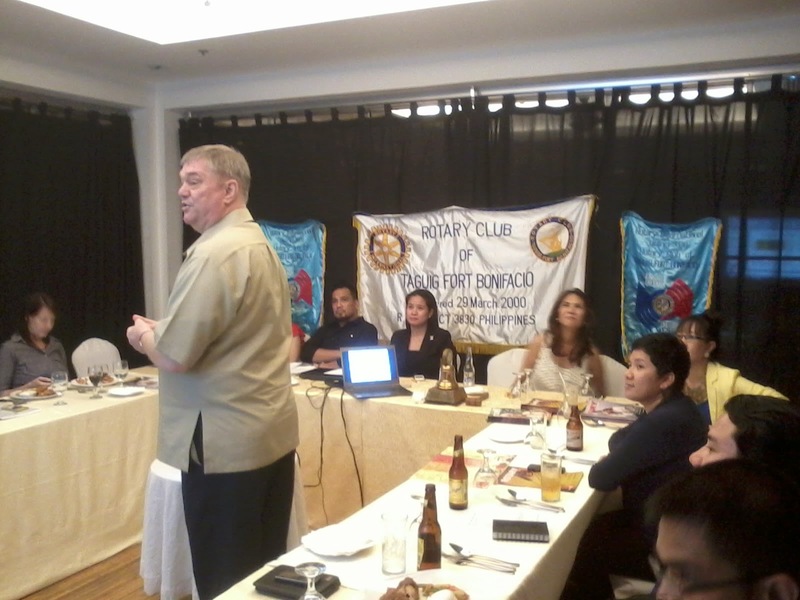 A very informative lecture given by Jules Maaten last Tuesday night at our Rotary Club of Taguig Fort Bonifacio, along with RC Makati Pio del Pilar. Not many people were able to come though although they really wanted to hear Jules' talk. 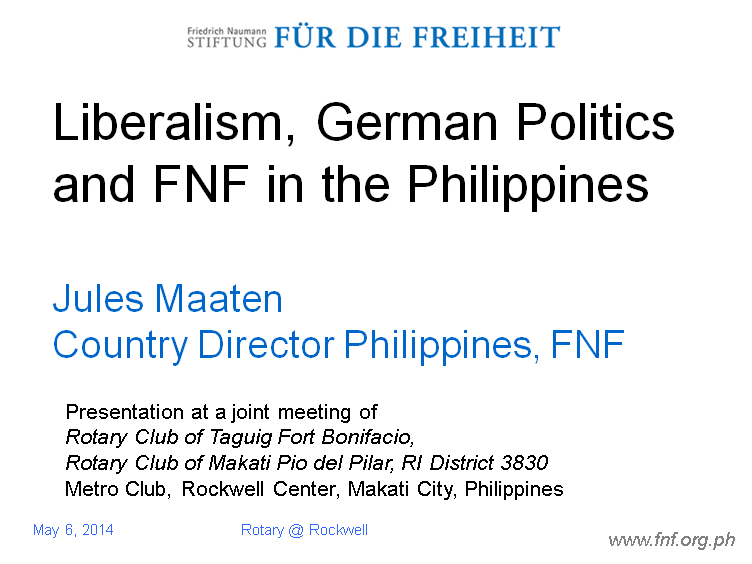 Like at least three from the Initiatives for Filipino Liberty (IFL) group, at least three from our club, and so on. So this blog post is for those who were not able to come and regular readers of this blog. 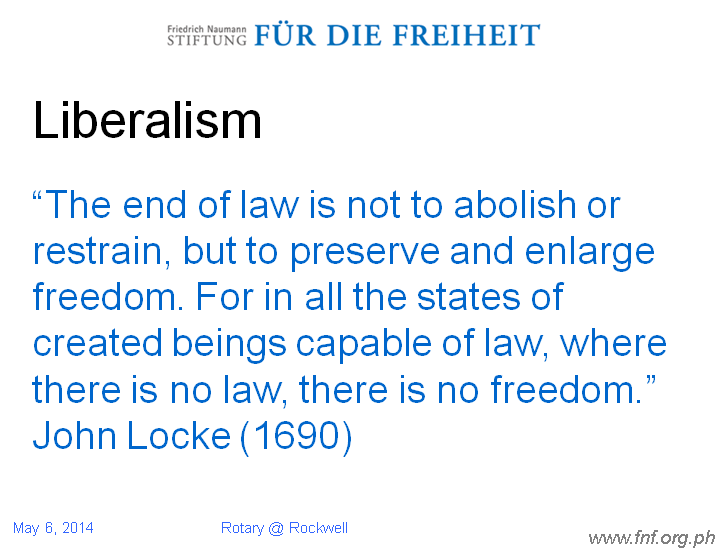 * Origin in protecting the individual against institutions of power. This quote from JS Mill, among the classical thinkers of liberal philosophy, is clear and direct. 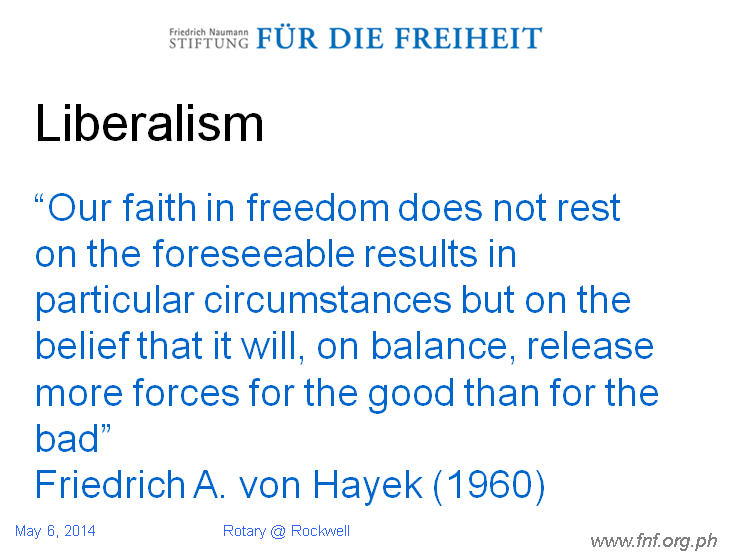 I like this quote from my favorite economist and philosopher, F. Hayek. Yes, allow people to decide things for themselves, to make mistakes, to excel. * Don’t leave debts to future generations. The last item is important. As Germany and many European and rich economies go deeper and deeper in public debt, with huge interest payment annually, the economic freedom and well being of the future generation is heavily compromised. 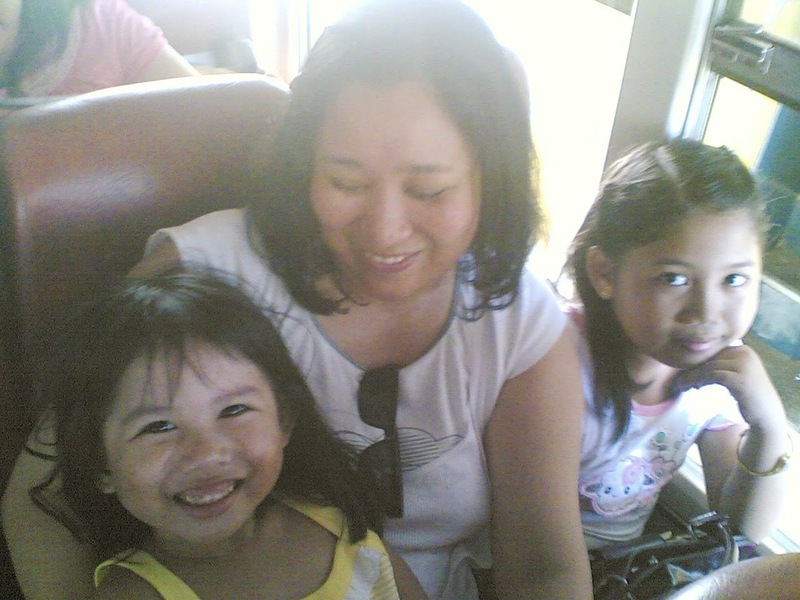 This is my sister in law, Gemma Barilea-Oplas, holding my elder daughter Elle Marie, and beside her lone child, Lois, sometime in late 2010 in our province in Neg. Occ. Elle is now 7+ years old while Lois is 13 years old. Gemma is an OFW, a nurse in King Fahd Medical City (KFMC) in Riyadh, Kingdom of Saudi Arabia (KSA) for more than a decade. It's a big Saudi government hospital. Gemma died the other day. It was a fast death. Confined in the same hospital where she was working last Wednesday night (KSA time), she was able to call my younger brother, Bobong, to inform him of her situation. A tube was put in her mouth by Thursday, she accepted Bobong's call, their last conversation. ICU by Friday, renal failure and plummeting BP by Monday, dead by Tuesday, this week. Bobong and Lois stay in Cadiz City, Negros Occidental, my hometown. He wanted to fly to Saudi, he went to Bacolod City last Monday for his passport application, was told that his passport will be released May 26. Too long, he contacted me, so I contacted a good friend way back in UP Diliman in the 80s, now DFA Assistant. Secretary Eddie de Vega for help. DFA responded with speed and efficiency, I am very thankful of them. But bad luck has taken over. Yesterday, I got my brother's passport at DFA even though he will not fly to Saudi anymore. DFA Asst. Sec. Fred Santos personally attended to me. Thanks again ASec. Gemma's death is suspected to be caused by the Middle East Respiratory Syndrome - Corona Virus (MERS-CoV): ASec Santos brought me to DFA Under Secretary Jesus Yabes' office, to ask how the DFA can help bring back the body. PH embassy in Riyadh has no knowledge about her death. The hospital has imposed a news bllack out about her case, and most likely similar cases involving their sick staff. ASec Eddie and I are of course disappointed. How can the PH government, DFA in particular, deal with this, how grave is the problem, if some Saudi government hospitals have this poicy? Maybe the hospital wants to further study the body whether it is indeed MERS-Cov or any other disease which caused the death. But they should have informed the PH embassy. The news black out policy by the Saudi government hospital, even if done temporarily, strengthens suspicion that the MERS CoV problem there could be worse that what the Saudi government would reveal to media and the public. Similar to China government's news sanitation policy when SARS spread there and killed several people. The actual death toll was higher than what was reported. That is a problem Noy. 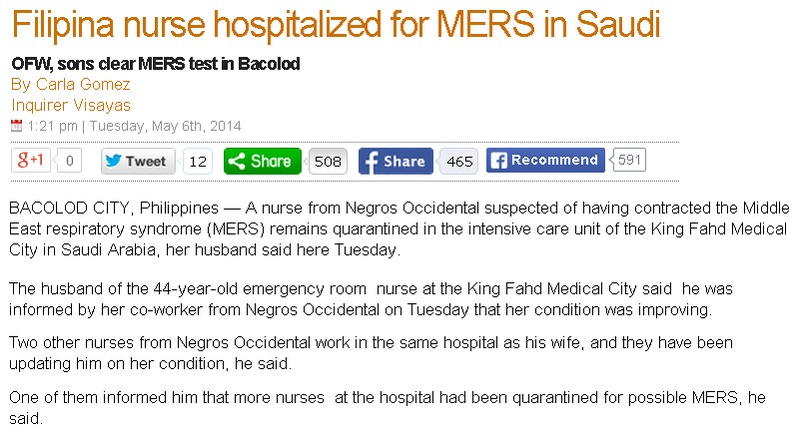 But this Merscov is taking its toll on our OFW health workers in Saudi. The government should act with the same urgency as it did when it published the names of a plane load of OFWs and asked them to come in for tests. By now the Philippine Embassy in Riyadh should already have an action plan on how to respond to our OFWs who fall to the Merscov. 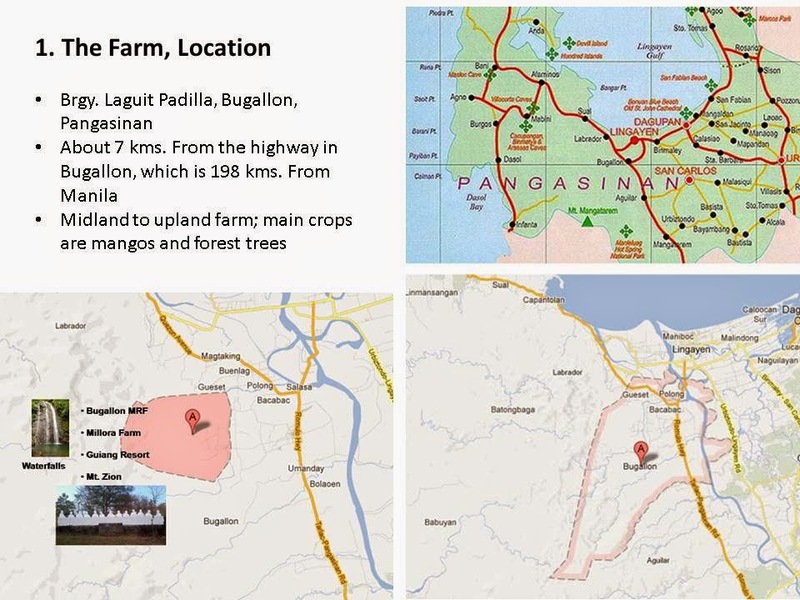 Maalarma na sila para sa mga kababayan natin na na-expose na sa Saudi, hindi lang sa pag naglanding na sila dito sa Pinas at madadamay tayo at saka pa lamang aaksyon ng lubos. The highest diplomatic measures should already be undertaken as we speak to protect our OFWs in Saudi from the Merscov. Jojo is right. My brother asked for a copy of Gemma's medical abstract through her close friend, also a Pinay nurse in the same hospiital. I hope they can give the abstract. It is not official yet if it was MERS CoV or other disease that killed Gemma. But when she was confined last Wed, all the symptoms of the disease were with her. I discovered last night that the Inquirer has reported it the other day. A related news from interaksyon last week. "Public concern over the spread of MERS mounted earlier this month after the resignation of at least four doctors at Jeddah's King Fahd Hospital who refused to treat patients for fear of infection...."
I think the PH Embassy in Riyadh will contact KFMC to get the official report, even if the latter will insist on its news blackout policy, implicit or explicit. I do not know if the hospital will take it against my brother that I write this story as this may put them in a bad light somehow. 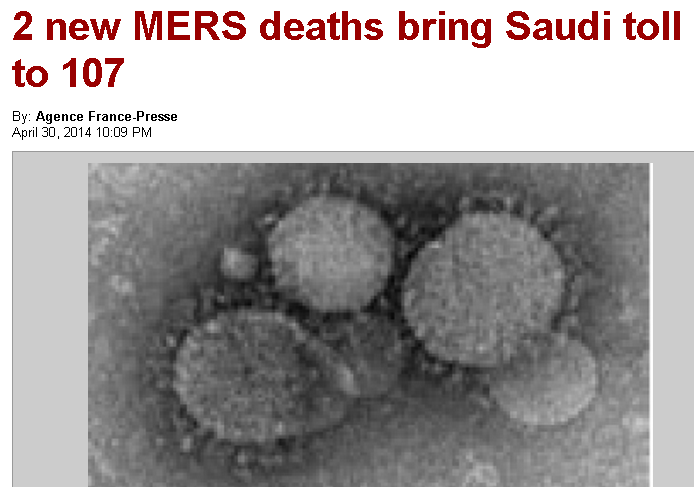 But it is for the benefit of both KSA and PH governments and the public in general in both countries, if there is more transparency how grave or non-grave the situation of MERS incidence is in KSA. To Gemma's siblings, parents, relatives and friends, in Cadiz and elsewhere, this is a sad reality that we have to accept, including the delayed repatriation of her body back home. Climate Tricks 30: On the term "CC Denial/Denier"
I commented that the term "climate change denial" is stoopid. I am a skeptic, and I do not deny climate change (CC). It is true. It has happened, it is happening, and it will continue to happen in the future. Climate changes from warming-cooling-warming-cooing-warming-cooling... in endless, natural cycles. CC is mainly natural or nature-made, not man-made. On the contrary, climate alarmists deny that global cooling can also happen along with global warming. Alarmists deny that CC is cyclical, they deny that CC can be nature-made. Global warming (GW) was true. 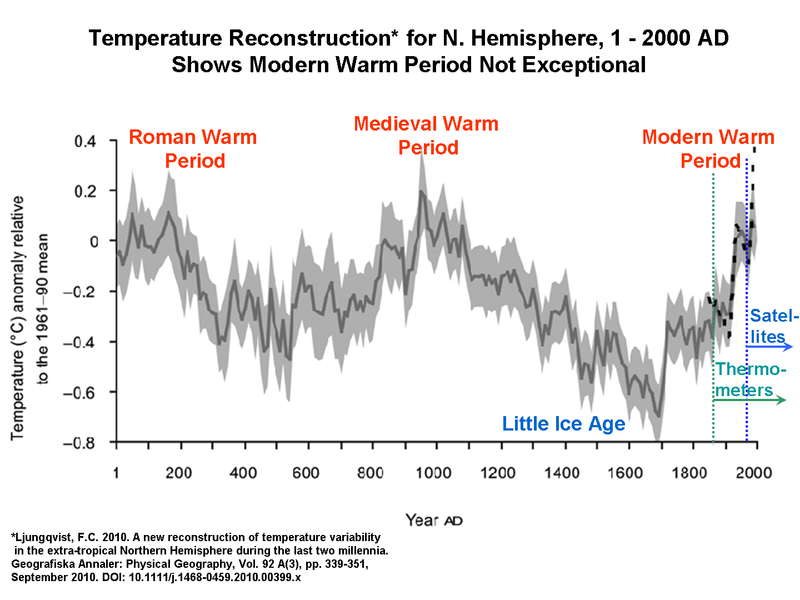 It did happen -- roman warm period, medieval warm period, past century's warm period. Both GW and CC are true. What is being denied by the skeptical groups is the "man-made" adjective. It should be "nature-made GW" and "nature-made CC" and "nature-made global cooling". Here's a good chart from Dr. Roy Spencer in a testimony at the US Senate last year. Roman WP and Medieval WP shown. They occurred more than 1,000 years ago, not a single car existed then, "man-made" CO2 emission except breathing almost zero, yet GW happened. Now the UN, Al Gore, etc. 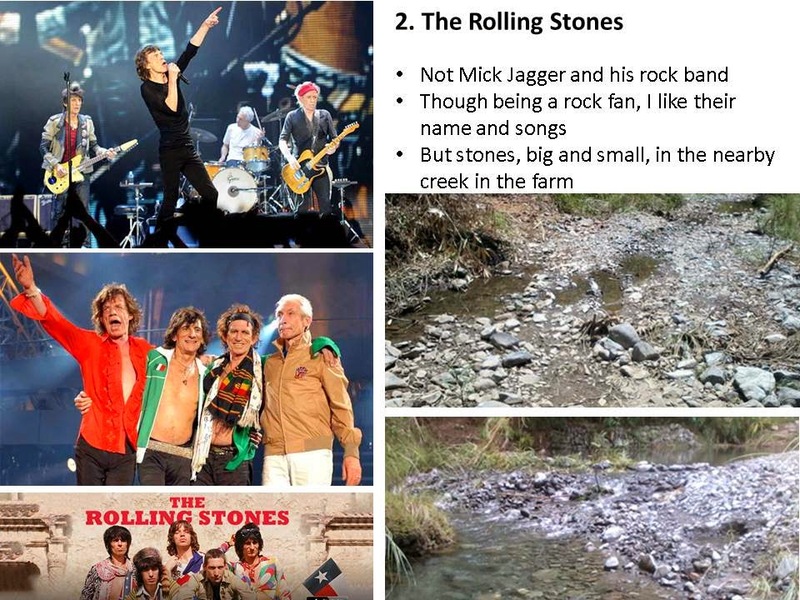 say it is mainly anthropogenic and did not mention RWP and MWP. Senate EPW Hearing: “Climate Change: It’s Happened Before”, July 19th 2013. I have no problem with renewables. If people put up solar panels in their houses, or windmills in their farms or backyards, fine. It's their own money. What I dislike is forcing everyone else to subsidize solar and wind, like the feed in tariff (FIT) in the PH's renewable energy (RE) Act. 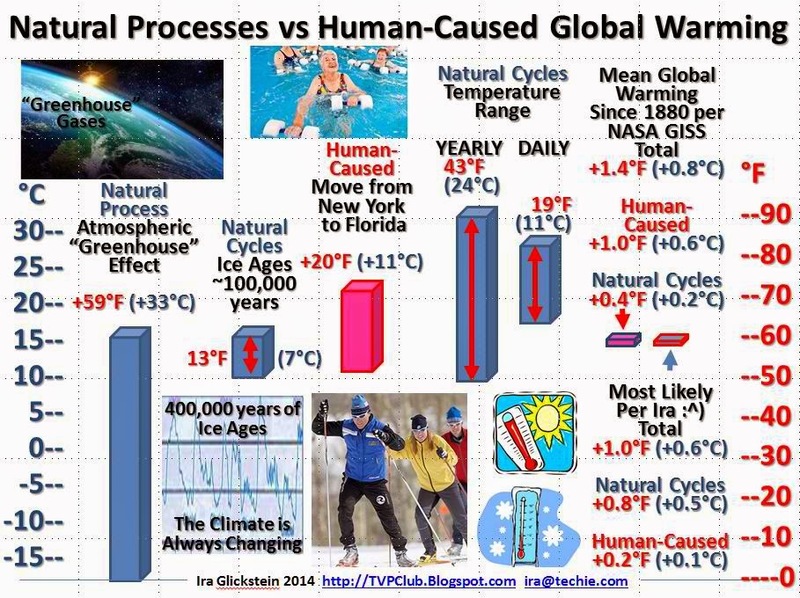 Even the warming scientists cannot an answer, how much of the recent warming was man-made and nature made? 10-90%? 25-75%? 50-50? 90-10? Assuming they give such estimate (for now it's zero), what explains for the roman warm period, medieval warm period, when there was not a single car, not even bicycles? If GW will happen even if we throw all the existing cars and planes and malls, and global cooling will still happen even if everyone in the planet is driving a car, what's the point of all those "fight man-made GW/CC" policies? I only see one goal for their activities. More politics, more government, more bureaucracies, more junkets. In an earlier discussion, a friend Samson P. observed that Climate Variabilities and Extremes (CVEs) has been cited too often by the warming camp as “proof” of anthropogenic CC. Yes, the alarmist groups say that less rain and more rain, less flood and more flood, less snow and more snow, less cats and more cats, they are ALL proof of man-made CC. This is a very dishonest, sigurista argument. Many climate research have been done that point to the role of natural factors like the Sun, galactic cosmic rays (GCRs), water vapor, volcanoes and geologic movements, etc. on planet Earth's climate. The problem is people won't find what they are not looking for. If they are so preoccupied to find only anthropogenic sources, that's what they will find, no matter how small, then amplify or exaggerate it. In IPCC AR4 (2007), of the 9 factors as contributors to past century's warming, 8 of them were anthropogenic. Meanwhile, this is very informative. How much of warming in the past century was due to nature, how much from humans? Are GHGs evil or saviour? Without those GHGs, we should need perhaps 1/4 inch thicker skin, otherwise no life as we know it is possible, simply too cold. 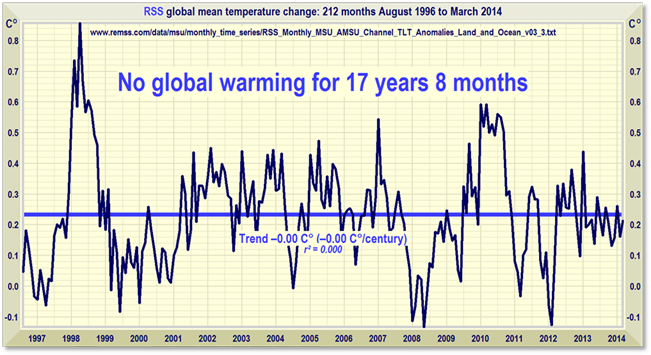 Putting Human-Caused Warming in Proper Perspective by Ira Glickstein, April 7, 2014.